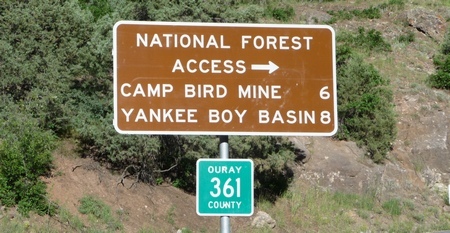 This sign on US Highway 550, just south of Ouray, Colorado, announces the road to Yankee Boy Basin. 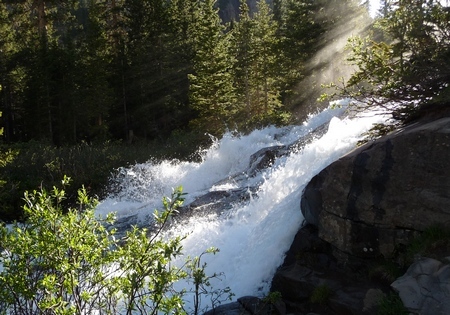 To get to Yankee Boy Basin, go south through Ouray. The highway takes a sharp right just as it leaves town, then ramps up several hundred yards. It then turns to the left. Just as the highway straightens out, that’s where the turnoff is. You’ll turn right and say good-bye to paved road. Yankee Boy Basin is a popular place. I started my ride up the canyon about 6:00 p.m., and when I came down there were still people going up. And that’s on a Wednesday evening. You can imagine what it’s like on a Saturday or Sunday. The big draw is the wildflowers. Normally they’re at their peak toward the end of July, so I wasn’t expecting much, but as I stepped toward Twin Falls, my eyes caught a columbine—the state flower of Colorado. I’ve posted the wildflower pictures separately. A word of warning. From the highway it’s 5.2 miles to Camp Bird and a further 2.2 miles to the restrooms in Yankee Boy Basin. That’s 7.4 miles. It’s an elevation gain of 2691 feet per my GPS track. That works out to an average grade of 7%. You’re going to be doing some climbing. The road is in “good” shape, meaning it’s easily passable on a dirt bike. It’s also wide enough for Jeeps. I’d say even a low-clearance 4WD vehicle such as our Chevy Blazer could make it if you’re careful in a couple spots. The road is dry with a couple small streamlet crossings near the top. The speed limit is 20 mph in the mid-section and 15 mph after that. I didn’t hurry and took much of the latter part of the road in first gear given the uneven climbing. One thing to watch is the road surface. It’s not clean. It’s covered with some of my least favorite stuff, scree (see photo). Scree is the term for lots of loose rocks ranging from golf ball size up to softball size and bigger. A couple of the switchbacks are full of the stuff—use your best technique. Overall, I’d rate the road as okay for a beginning dirt bike rider who has a couple months’ experience, and if you’re a beginner, you should probably go with someone. There are some very steep drop-offs. Scree: this kind of stuff isn't too bad if the road is level, but I hate it when ascending steep roads. And the roads in the high country around here are full of it. One of the more famous features of the road is a short stretch where the road is literally carved into the side of a vertical cliff. Here’s a photo. What looks like fog is actually dust from a vehicle that just passed. That's a one-lane road there. Runoff has eroded the part closest to the inside of the overhang, but there's no problem making it on a bike. The road up toward Yankee Boy Basin is also the road to Imogene Pass and down into Telluride. The intersection is well-marked. Note the emergency call box. It’s the only one along the entire length of the road. Here's the sign for the Imogene turnoff. Imogene is not for the faint of heart and is a significantly more difficult road than the road the rest of the way to Yankee Boy Basin. Once you get into Yankee Boy Basin itself, you can park just about anywhere. The traditional end of the road is at the Forest Service restrooms, but there are (bad) roads further on. There’s a road up to the trailhead for those wishing to ascend Mt. Sneffels, but it’s extremely rough and most hikers park in the vicinity of the restrooms. A couple hundred yards prior to getting up to the restrooms is the parking area for viewing the iconic Twin Falls. What’s less well known is there’s an equally picturesque falls just downriver. This time of year there’s lots of water. You can't quite make it out from this angle, but that's two waterfalls right next to each other: Twin Falls. You can see the sunshine light up the spray. 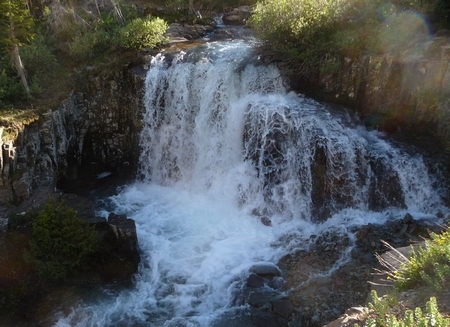 The lower falls are just downstream. Note the steep drop-offs. Be careful! There are no guardrails of any kind. Your safety is up to you. As you might imagine, descending the road is easier than ascending, but do watch your speed. Do not barrel into blind corners as you may find yourself hitting scree. I went down about the speed limit. Note that four-wheeled vehicles will be traveling considerably more slowly than you—the vehicle going uphill has the right of way, so if you see a vehicle coming, find a place to pull over safely. 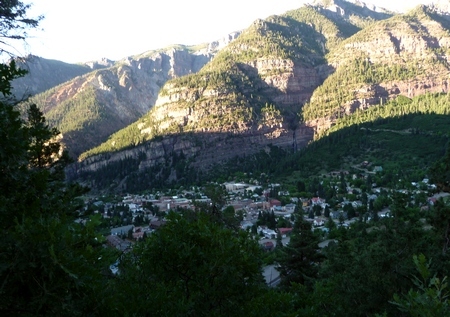 You know you're almost down when you can see Ouray below you. And, as promised, here’s the GPS track. This track is made up of parts of the going up track and parts of the going down track. I wore the GPS on my back, but still the steep canyons make signal reception difficult. Note where the going and coming track overlap—they show a distance between each other of 450 feet! Do not rely on GPS for a super-accurate position in these giant canyons. 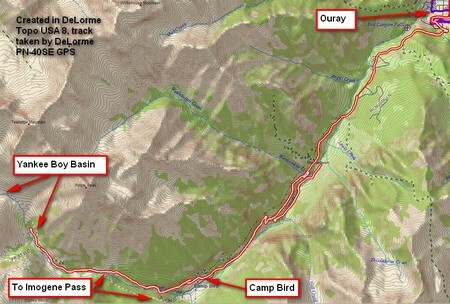 The distance from Ouray to the Camp Bird cutoff is 5.2 miles, and Yankee Boy Basin is a further 2.2 miles. Remember—that’s an average grade of 7%! Here's the GPS track. The DeLorme PN-40SE did a remarkably good job considering how deep the canyons are, but note that I had to piece this track together from both the going and coming tracks, each of which had sections of no signal. The overlap shown, near Camp Bird, is as much as 450 feet between going and coming! Beware of GPS accuracy in these deep canyons.